When most people think of team gear they think of the uniforms a team wears to compete on the field, court, or ice. These uniforms usually have a certain pattern or set of specs that are mandatory across a certain sport, league, division, etc. For example, the National Federation of High Schools (NFHS) has certain specs for the design and color of a jersey, which vary by sport. NFHS requirements cover things like the color of the home and away jerseys, number size, short length, etc. While these purchases are mandatory to compete in games and design compliance an absolute necessity, we are finding that more and more teams are purchasing additional team gear to be worn outside of the competition. These "standard issue gear" or team player packages have no regulations or rules constraining their design and can be built to meet the needs of teams on any budget. Youth, high school, and college athletics have become much more organized and many are taking a professional approach to the way they operate. Not only are athletes participating in more rigorous competitions and practices, but the emphasis on fitness and training, starting at a very young age, is becoming more and more important in becoming an elite athlete. If you want to up the professional air of your team, they must have matching team gear in the weight room, around campus, and while traveling. There is a wide variety of products and packages that can make up a team player package or standard issue package depending on the sport. The most common items requested are a shirt/short combo package for a team to wear for training or workouts. There are many brands that offer these products, but the most common feature to look for is a moisture management or moisture wicking fabric. Most of these fabrics are 100% polyester, breathable, and contain an anti-microbial or anti-odor technology. One of the biggest brand names when it comes to workout gear is Under Armour with their signature moisture transport system which makes up many styles in their product line. 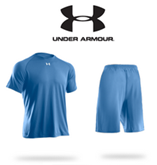 Their most popular items for working out are their UA Locker Tee and UA Micro shorts. If your team or league doesn’t have the budget for Under Armour, don’t worry – there are many options out there with similar functionality that are more cost effective. Champion Athletics Essential Performance Tee and Polyester Mesh Shorts are also a great choice and a little less expensive and the Sport-Tek brand is even more cost conscious with their Competitor Tee and Short combination. In addition to shirts and shorts, many teams like to expand their standard issue gear to be worn in a range of climates by including hooded sweatshirts and sweatpants to create a 4-piece package. Teams with larger budgets may spring to add an additional warmup jacket and pants as a travel uniform to create a 6-piece package. 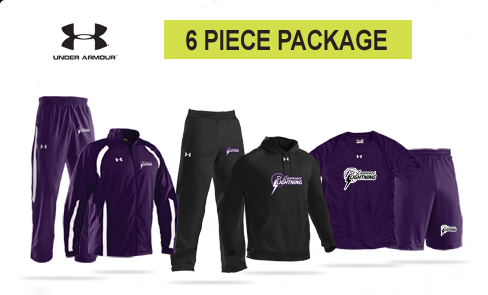 Under Armour is a great source for a high performance 6-piece team package which would include their UA Locker Tee, UA Micro Short, Armour Fleece Hoody, Armour Fleece Pant, and a warm-up suit like the Undeniable II Jacket and Pant. No matter what a team’s budget is, if they want a professional look from the workout room, to the dorm room, to the team bus, and locker room, a team dealer should be able to find a brand and solution a team will be proud to put their logo on and wear with confidence! For more information on what to look for in a team dealer, download our free guide below.